Veggie Lasagna Roll Ups are a quicker and easy alternative to traditional lasagna. They have all the same ingredients, but somehow just come together a lot quicker! Must be the rolling instead of the layering that feels like it just zips on by! They make a wonderful Sunday Night Dinner or vegetarian Thanksgiving main dish. Place ricotta cheese in a fine mesh strainer over a large bowl, and drain in the refrigerator for at least 1 hour. This will help the ricotta lose some of the water which can make your sauce too runny. Heat olive oil in a large pot. Sauté onions until fragrant and translucent, then add zucchini and mushrooms until cooked and tender. Season with salt and pepper. Add wine and cook until most of the liquid is evaporated. Add chopped tomatoes, tomato sauce, salt, garlic and Italian seasoning (This link goes to Amazon where I am compensated for products sold). Simmer for 20 minutes. Meanwhile, combine the ricotta cheese, egg, Italian cheese, herbs and salt and pepper. Transfer tomato sauce to a 9 x 13 (23 x 32cm) casserole. Spoon out ¼ cup (60 ml) of the ricotta mixture and place on one end of the lasagna noodle, roll it up, and nestle into the sauce. Spooning the sauce on top. Continue the process until all lasagna noodles are filled and nestled in the sauce. 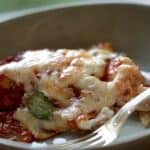 Top with the mozzarella cheese on top of the entire casserole. Garnish with the fresh basil leaves. Bake at 325F (162C) for 40-45 mins until cheese is nicely browned and sauce is bubbling underneath. Use Gluten-Free Fresh Lasagna Noodles. Sometimes these are easier to find in the refrigerated section of your supermarket! Do not try to assemble this and place in the fridge before baking! The ricotta cheese will emit too much moisture and split open your lasagna noodle and make a big watery mess. To prep in advance, keep everything separate (the ricotta cheese mixture, the sauce can both be made ahead of time. Then just before baking, assemble and serve!